Glossy white petals with avocado-green stripes give this Paphiopedilum a certain jungle chic. A testament to its exotic nature, the blossom of this "carnivorous" orchid has a pouch that lures insects inside to pollinate it. 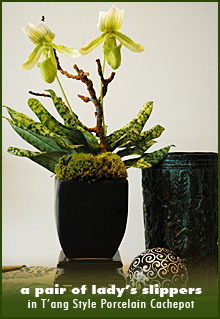 Regardless of the danger this plant may present to bugs, humans can enjoy Paphiopedilum indoors with very little care... The perfect touch to this elaborately detailed arrangement, our classic Tang style Porcelain Cachepot. Click image for more options. Friday, place your order by noon PST.